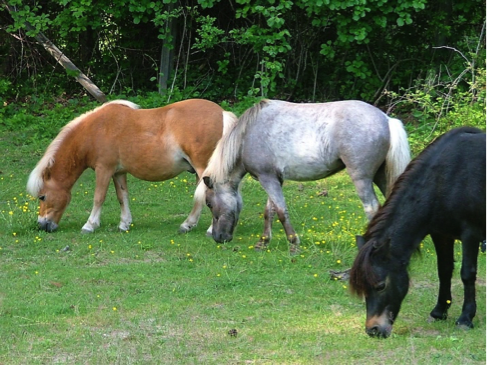 Northeast Miniature Horse Club has a continuously growing, and ever-changing list of Miniature horses, and an occasional pony available for adoption. Featured below are some of our wonderful minis looking for a forever home with YOU or someone you know. The horses listed here are available for adoption. Some are rescues, and some are horses donated to us by caring owners for our re-homing program. Some have sad histories, and many have been loved and cared for their entire lives. We will provide you with as much history as we have on any horse, including medical records if available. We adopt by contract to pre-approved homes, and track our adopted horses for life. If you would like further information, or to arrange to meet any of our horses, please contact our Rescue/Adoption Coordinator, Cindy Broady, at 603-774-7050 or mochaminis@comcast.net. and low carb diet per our specifications. Harbors trust issues from early treatment, and needs confident and patient handling. Not dangerous, just scared. HOLLY – 33.5” bay pinto mare with blue eyes. Birth year 1997. Former show horse and broodmare. Healthy, no issues, and great to handle. Owner requires that she be stalled at night and not be turned out with full size horse. Plainfield, CT. Adoption fee $300. MADDIE & SELAH – Mother and daughter and must stay together. Maddie is a sweet perfect lady. Selah is her cheerful, bratty daughter, in need of finishing school. Excellent driving prospect – brave and sane. Hollis, NH. Adoption fee for the pair $450. SUMMER – 30” chestnut pinto mare, year of birth 2002. 1 blue and 1 brown eye. These horses are all healthy, no issues, sweet and easy to handle. Same owner for most of their lives. All have AMHA papers and would make excellent 4-H projects. Both Taurus and Cameo were always well handled, and have been used for equine assisted therapy. Wonderful manners and personalities. YOSHI – 36” silver dapple mare, year of birth 2002. From our Upton Rescue of 2005. Her name means ‘lucky’, and so she was. Formerly very fearful, now loves people, especially kids, loves attention. Great for all handling basics. Also used in equine assisted therapy. Yoshi drives but has the ‘fear factor’, so caution is advised. Any two of these can be paired for a discounted donation. Would really love to keep this herd together. Substantial discount in that case. and Charley has been trained to drive. Sweet, friendly, well mannered gentlemen. Toby and Chloe are sired by the same horse, and their dams (both NMHC rescues) are mother and daughter. They look like twins and are best buddies. Both are sweet and friendly and still ‘babies’, ready to continue their education, even if that means just hanging out and soaking up love and attention. Mini and Shetland 22 year old mares, both silver dapple pintos. Currently in Wilton, CT. Friendly, middle aged ladies, used to kids and crowds. Better pictures coming soon. Adoption donation for the pair $400. Frankie has been adopted! Congratulations to Rachel and daughter Ashley in CT.
Beautiful Frankie has been in the same loving home for most of his life. He is a cryptorchid stallion, who displays no stallion behavior and has been turned out with other geldings. His owner, whose changing life circumstances have forced her to give up her horses, tells us that he is a total sweetheart, and is the horse she would choose to bring on nursing home visits or other outings. He is bomb proof and always eager to please. We are fundraising for Frankie’s castration surgery, which will cost at minimum $1500, and are happy to report that we are half way there!! If you would like to adopt Frankie, your adoption donation of $400 would go totally toward his surgery. Frankie can be seen in Monson, MA, and his move must happen soon! Fritz (now known as Cheerio) has been adopted! Congrats Nicole! Handsome chestnut Fritz came to us for re-homing as the horse who could not be caught! He had been a companion to a huge draft horse, and left in a run-in situation to eat free choice hay until he was about to burst. We can only guess what his life was like prior to the two years he was unhandled. His first reaction to almost anything was to run away – fast! But then he would spin around and investigate. Fritz is definitely a work in progress and will need his person to be patient and relaxed and willing to put the time in to gain his trust. He has come a long way in his foster home. He is never dangerous in any way, and once haltered, his good manners are evident. We feel Fritz will do best with a stall separate from turnout, so that he must be handled several times a day. He also finds ‘safety’ in his stall. This boy will be well worth your time and effort! Fritz can be seen in Gilmanton Iron Works, NH and his tax deductible adoption donation is $300. bella and Leah have been adopted! These pretty silver bay sisters were raised from birth by their current owners. 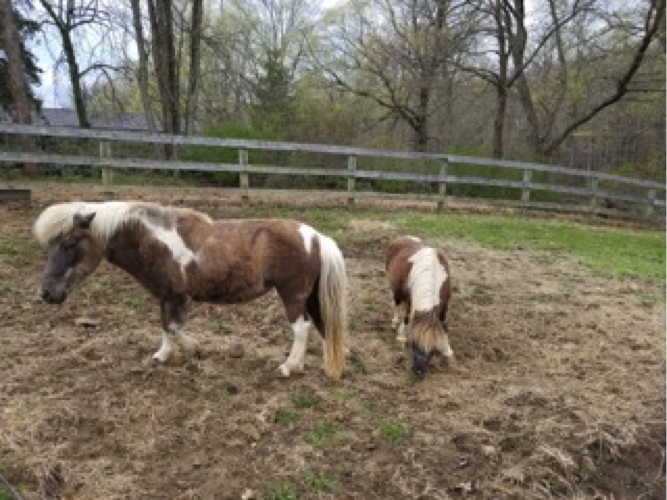 Sadly, health problems have forced this retirement age couple to give up their herd of 6 Minis, and we are hoping to have them all placed by this fall. Though well mannered, cooperative and friendly, Bella and Leah are blank slates who are ready to learn whatever you want to teach them. They are waiting to join your family singly (you must have at least one other equine) or as a pair. They can be seen in Goffstown, NH and their adoption fees are $300 each, or $450 for the pair. The horses below are all available as pairs. They are bonded to the point that it would be detrimental to their health, not to mention unkind, to separate them. Three can be a magic number, if you are looking for a companion to a single horse. One can leave for an event or outing, and the ones remaining behind have each other. Please think about it! These two have been adopted! 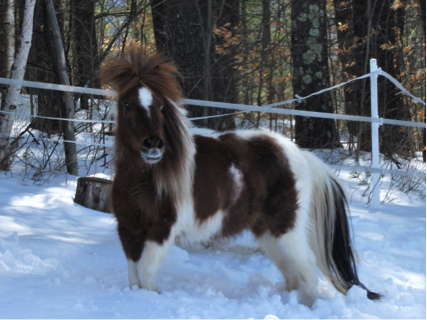 SNICKERS was the herd stallion for the Goffstown Mini herd mentioned above. He was gelded three years ago. Snickers is very much a gentleman and easy to handle. ‘Baby’ CODY, who actually doesn’t turn 2 until August is a character! Loves to run and play with his Dad. The owners want these boys to stay together since Snickers is losing ‘his’ herd, and Cody his mom and sisters. They will make great additions to your own herd of humans and equines alike. Snickers and Cody can be seen in Goffstown, NH and their adoption fee is $450. Boone & Zach have been adopteD! How would you like two warm and cuddly teddy bears to help you through the winter? Say hello to Boone and Zach, ready to introduce your kids or grandkids to the wonderful world of horses, or accompany you on a winter’s walk, or just hang out and ‘help’ while you do yard work or clean their stalls. These healthy boys are buddies of many years and would like to stay together. Boone is the taller dark bay, and Zach is the silver dapple with ‘chrome’ and a bad haircut! They are not rescues, but new to our re-homing program, up to date on everything, and ready to move right in with you and assume ‘my pretty pony’ chores. Boone and Zach are currently in foster care in Londonderry, NH, helping with ‘little kid duties’ in an equine activities program. They are available for permanent adoption. Whiskey and Molly have been adopted and will be providing daily therapy and interaction for the lucky residents of Life Care Center of Nashoba Valley in Littleton, MA! We are so proud of the important jobs they will have! This adorable pair, another set of ‘returnees’, is without a doubt the most definitively “kid safe” pair of minis we have ever had run through our program. Their adoptive family is moving to the west coast due to a job change, so Whiskey and Molly are in need of a new family. They are happy to stand for hours of awkward grooming and even carry squirming toddlers, with lots of supervision of course. Check out the videos! They are perfect horses for nursing home visits and equine assisted therapy programs. Whiskey has a non-problematic condition knows as ‘roaring’ (paralyzed Larynx). He shares this with many famous race horses! With exercise, he makes a funny noise in his throat. He is not a horse you will want to drive. It does not bother him, he is otherwise healthy, and we have his history for the last 9 years. Don’t wait long on these two! Whiskey and Molly may be seen in Methuen, MA and their adoption fee is $450. Add a smile to your day - take a look at some of our SUCCESS STORIES!